So, part of my job as a Deadspin intern has involved writing some those fun Olympic field guides that you may have seen on the site recently. Today I started writing one about Ann Romney's dressage horse, Rafalca, who will be competing in the London Olympics. I wanted to get a nice photo of Rafalca to run with the story, and I ran across a site called Dressage-News.com that had multiple photos of Rafalca in action. I reached out to Ken Braddick, the proprietor of the site, to see if he might be willing to allow me to use one of his photos, with full credit given. I am writing a story about Ann Romney and her horse Rafalca for Deadspin.com as part of our Olympic coverage. I was wondering if you might allow us to use some of the photos from this story: http://www.dressage-news.com/?p=16317 to go along with our piece. We will of course give full credit for the photos to you and your site. Afraid not. No permission is granted. If we were able to use some of your photos, it might help generate some increased interest in your site. I have twice your viewership. According to the latest market survey released end of June dressage-news.com is #1 equestrian Internet site in world in both viewers and credibility. I spend a fortune covering equestrian events around the world. I don't know what your site will do to increase my viewership/credibility. I think I know my industry well and do not want my images, acquired at enormous cost (I've been in Germany since July 2, heading to London tomorrow and will be there through the Olympics, my third trip to Europe this year) used for purposes other than the way I present them. I do not sell my photos, so by implication don't care about expsue to a "larger" audience. And scene. 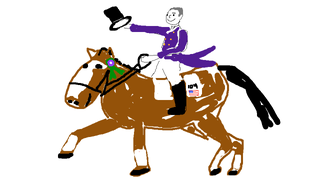 If you weren't already convinced that dressage is a sport that is populated and appreciated largely by snooty assholes, you probably are now.